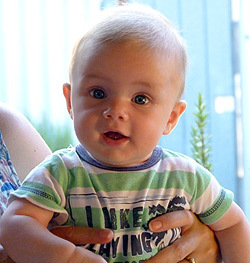 Welcome to Casper's website, which is all about the third born child of Rob and Clare Wood. Here is all the latest news. Casper took his first steps while we were on holiday in Bali. learning to walk, down the hallway just like his siblings did. siblings? Photos of Olive, Jetson and Casper all at about 6 months of age. Our annual family Christmas photo. Casper in the garden. At 4 months, he is doing really well lifting his head. He is very strong, and we expect him to be up and walking early like Olive was. Santa's little helper. 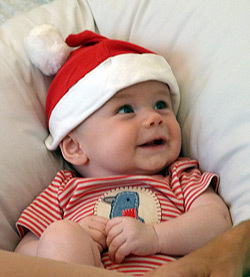 Casper may be only young, but that did not stop him getting heaps of presents, mostly from his granny. 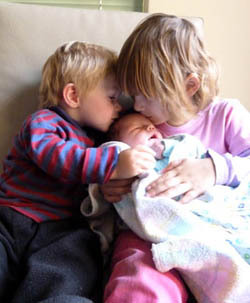 We have compared images of the three kids before, and at 3-4 months they still show striking similarities. People often comment that Casper looks like Jetson, but many of them did not see Olive as she was growing up. 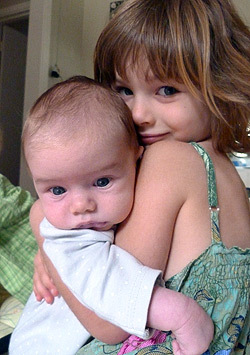 Take our word for it, Olive and Casper are spitting images of each other. Jetson teaches Casper a few things. The Terrible Trio of kids - not really. This is Casper at 3 months of age. 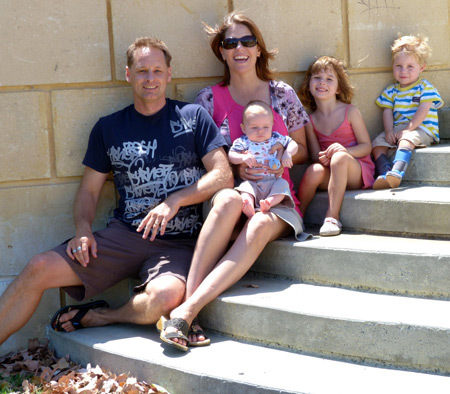 We all went camping (of sorts) at a caravan park in Busselton. We think Casper is the outdoor type, as he slept much better in the tent than he does back home. Maybe it is the fresh air and the fluttering of the tent flaps that send him off to sleep. 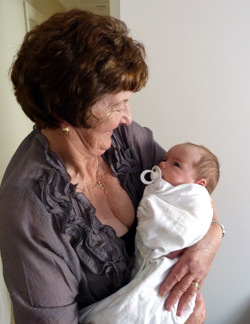 Granny and grandpa have come to Perth to see their new grandson. We spent lots of time together, such as a day at Landsdale Farm. We had a birthday party for Jetson too. It is such a rare sight to see Casper fall asleep that we had to take a photo to show that he does do it occasionally. 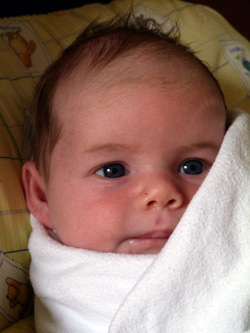 Here he is at two months of age. 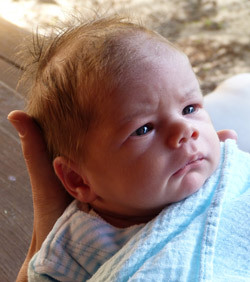 Casper is already showing his good looks just like his siblings. Today his brother just came back from a short stay in hospital. Three kids in a tub - the kids play so well together already. It is a tight fit in the bath but they love it. Here's a video of Casper resting on the lounge - for a while anyway. He constantly craves attention and doesn't like being left alone. Yes, that is tiring! Clare had a work conference in Melbourne that she did not want to miss, and of course had to take Casper with her. To our surprise he slept all the way over on the plane, but unfortunately did not maintain such good behaviour for the whole weekend. Luckily we had super granny Pam to help out. 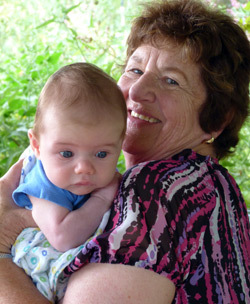 She was only too happy to spend some time with her latest grand child, and she did a fabulous job. Here are a couple of photos of Casper at around 6 weeks old. What a size difference! You don't realise how big Jetson has grown until you place him next to a newborn. Jetson has been very loving with his little brother right from the start. We can just see them having a special bond for life. 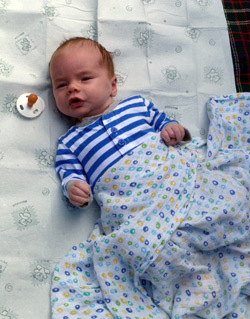 Here he is nearly 3 weeks old. It has been a hard week for us all as Clare has been pretty sick with the flu, and unable to get the rest she needs to recover. Fortunately Casper has been OK, except for being always hungry and not sleeping as long as we would like. 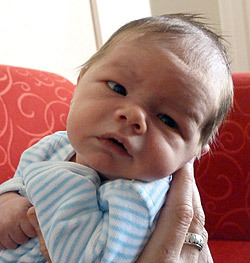 Here he is nearly 2 weeks old, showing off his serious look. Everything has been going well thanks to lots of help from Casper's grandmother Nina, emergency food supplies and other help from friends. Rob has taken time away from the computer to help out, mostly by taking Olive and Jetson out to give Clare some quiet time. No, Clare has not got a new job as a supermodel. We did find out today that Supermodel Claudia Schiffer and her husband Matthew Vaughn called their son Caspar. 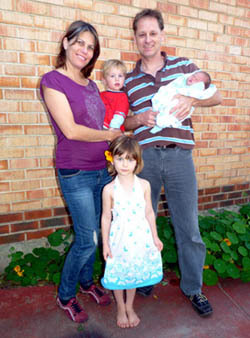 This is old news (but new news for us), as they now also have two daughters Clementine and Cosima. Father's Day. We had booked a breakfast about a month ago, not sure when the baby would come and if we would be up for it. 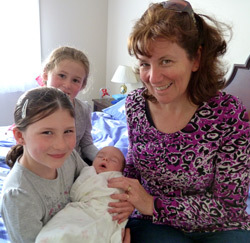 With a 3 day old and with a rough night's sleep, Clare was a trooper and came along to Miss Mauds for a buffet breakfast. Casper was great too, and mostly slept, making it a very enjoyable morning. Here is Casper in his first bath at home, our favourite photo of him so far. He's a looking a little bit jaundiced, but not too bad. Hi, thanks for having a look at the site. We have received lots of messages. Clare and Casper spent the night at King Eddie's, and will be coming home today. Back to life as usual?! A knot in the umbilical cord - True! 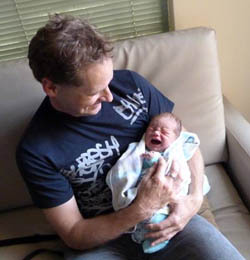 There were a few dramas during Casper's birth. 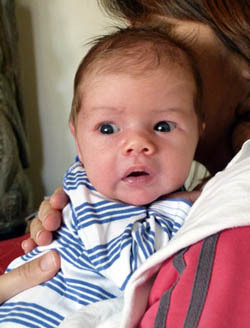 The midwife at the Family Birthing Centre noticed his heart rate dropping during contractions, and was concerned enough to have us transferred up to the main birthing ward at the hospital so Clare and the baby could be monitored more closely. After more investigation and concern, Clare was seconds away from being wheeled into surgery for an emergency caesar, when she announced that the baby was coming out! And indeed it did with no problems, with the doctor immediately seeing what the problem had been - a knot in the umbilical cord. Further investigation online since has made us realise how lucky Casper was. 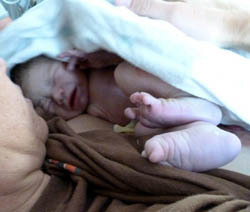 A 'true' knot, as this was, is a rare occurrence with a greatly increased chance of stillbirth, as it can cause the blood flow from the placenta to the baby to be cut off. We feel very fortunate that Casper came out unscathed, and very thankful to the skilled staff at the birthing centre and on the ward. 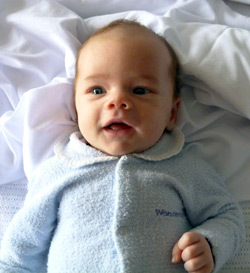 Casper Reilly Wood was born at about 11am on 31st August 2011 at KEMH in Subiaco, Perth. Weight 3.5 kg (7.7 lbs). 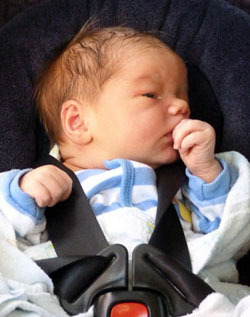 He was saved from the c-section by a last minute push by Clare, even a knot in his umbilical cord couldn't stop him. We are all very excited about this addition to our family. Is it just me, or are his feet really big? Look out Thorpey. Big brother is asserting his dominance right from the start. 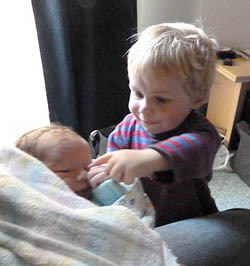 He loves his brother already, he wants to have a look at the baby constantly. See, there is brotherly and sisterly love. Dad hasn't lost the touch! and mum did a great job too!